First came the mint jelly, which admittedly isn't so weird. I've seen it before, often associated with lamb, and I know several recipes exist. It tastes pretty vegetal, but it's also quite sweet, which for me means it's a great addition to a turkey sandwich. Incidentally, mint turns very, very brown when it's cooked, so the food coloring is essential if you want that nice green hue. The cucumber jelly was really just done on a whim because, as I've mentioned, I'm pickled out. I had a few more cucumbers to use up, and I had jelly on the mind after making the mint jelly, so that's what I did. There were more recipes out there than I expected, and I used a mishmash of several. If I didn't know this jelly was made with cucumbers, I don't think I could've identified its flavor. There's a definite flavor there, and it tastes unlike any jelly you've ever had, but it doesn't scream CUCUMBER. The candied ginger really made it for me--I love its spicy kick. I'm not sure I'd make this jelly if I didn't have a glut of cucumbers, but I'm glad I tried it! In a blender, puree the cucumber, lemon juice, and vinegar until smooth. Strain the cucumber juice through a fine mesh sieve to remove any pulp. Put 2 cups of the cucumber juice and the pectin in a large saucepan over high heat, stirring well to dissolve the pectin. Bring the mixture to a rapid boil, then add the sugar and candied ginger, bring back up to a rapid boil, and cook 1 minute more, stirring constantly. Pour into sterilized jelly glasses and seal. Process in a hot water bath or store in the fridge. Crush or roughly chop the mint leaves, place them in a large saucepan, and add the water; bring to a boil. Remove from heat, cover, and let stand 10 minutes. Strain and reserve 3 cups of mint infusion. Add food coloring, if using, and lemon juice. Add the pectin, stir to dissolve, and bring the mixture to a rapid boil. Add the sugar and stir occasionally until it comes to a rapid boil that cannot be stirred down, then cook 1 minute more, stirring constantly. You are so creative! 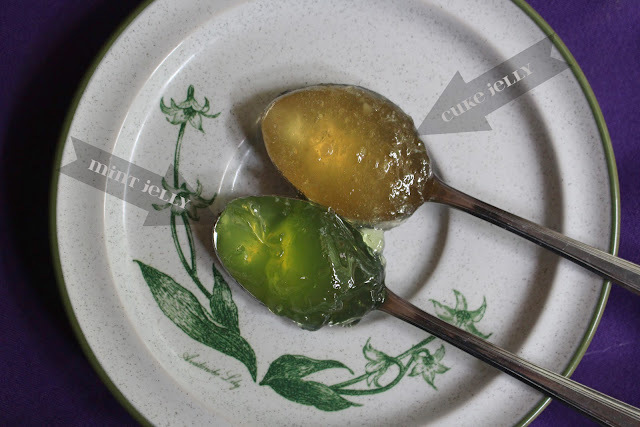 I want to try both jellies, esp. the one with cucumber and ginger. This sounds really interesting! Any idea if you could leave skins on (since you'll be straining the juice out)? Does cucumber skin have pectin like fruit skins do? I love mint jelly; I think it makes a great sandwich. And who'd've thought you could turn cukes into jelly? Brilliant, Grace! Are you doing all of this while Eva naps? I used to pop my kids into a playpen at the edge of the kitchen so I could finish what had to be done. @unknown: i didn't even think about that--it would've saved me a lot of time! i used pickling cucumbers, so i would worry about the taste of the skins coming through too much, but i think it would be fine to leave cucumbers meant for eating out of hand unpeeled! I loove these and love the colour ! look wonderful Grace! The colors are amazing and so must be the taste! That mint jelly is such a great colour! Love the sound of the cucumber jelly too, what a refreshing flavour. LOVE the title of this post :). I've never been into mint jelly but the cucumber ginger sounds delicious! I've had mint jam with lamb but never thought to make cucumber jam... adding the ginger is a great idea. Kind of funny, I saw a recipe for cucumber jelly this morning. Don't think I'm ready for it. Cucumber jelly sounds really delicious! I've tried mint, but haven't had it in a long time. I would love to make the cucumber jelly. Any idea how much the 6-8 cucumbers weigh? The cucumbers here come in very different sizes and I don't really know how big a typical American cucumber is, so it's hard for me to estimate. @Adina: I should have weighed them but I didn't, I'm sorry! The important part is the 2 cups of the cucumber juice-lemon juice-vinegar mixture, so keep going until you reach that! Wow, the cucumber-ginger one sounds absolutely amazing. Almost like the flavors I adore in a favorite cocktail. How genius to put it all together in a jelly. Both sound tasty and definitely a different flavor twist. I am most intrigued by the Cukey Gingery Jelly, the kick of the ginger would win me! Nothing boring about these jellies...very creative!